We'll be at the market to answer your gardening related questions. See you there! 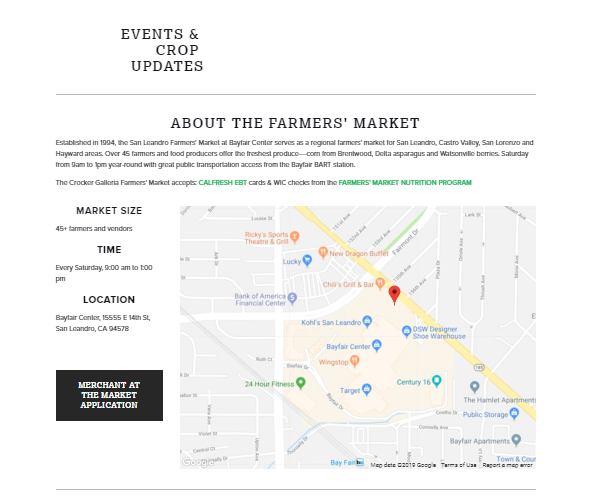 Established in 1994, the San Leandro Farmers’ Market at Bayfair Center serves as a regional farmers' market for San Leandro, Castro Valley, San Lorenzo and Hayward areas. Over 45 farmers and food producers offer the freshest produce—-corn from Brentwood, Delta asparagus and Watsonville berries. Saturday from 9am to 1pm year-round with great public transportation access from the Bayfair BART station.